Film Socialisme is an experimental assemblage of film, sounds, and text taking place in various locations including Egypt, Palestine, Odessa, Hellas, Naples and Barcelona. The movie is divided into three sections: the first is set on a Mediterranean cruise ship where Patti Smith sings to wealthy passengers who eat, converse, and gamble. Section two takes place at a gas station and neighbouring house where a French family debates revolutionary ideals. The third takes place in different areas across the world, showcasing a variety of characters and images in a poetic, loosely narrative style. 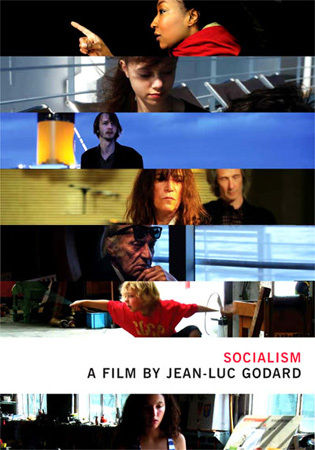 For those hoping that Jean-Luc Godard's final film – as rumour would have us believe this is – would be some kind of personal valedictory statement along the lines of Ingmar Bergman's Fanny and Alexander, Film Socialisme is likely to be a disappointment. Indeed, the hostile reaction from many critics suggest there are those who wish this particular cinematic vessel had never left port and that Godard would have done everyone a favour if he had shuffled off into retirement and never made another film again. However, there has also been a great deal of critical praise for the film -- and the clash between critics over its value is likely to have pleased Godard himself, who has spent his entire career upsetting viewer expectations as part of his quest to test the boundaries of what cinema could and should be. In the case of this film, that quest sees him experimenting with digital video at both its most scuzzy and most sublime, pursuing a narrative in the loosest imaginable sense of the word, and employing montage to maximum resonant effect. The film is divided roughly into three sections which act as a journey into a modern day Europe, haunted by its past and facing an uncertain future. The first section takes place on a Mediterranean cruise ship populated by a cross-section of passengers ranging from an aging war criminal to rock star Patti Smith. All nations are represented on board. We see them eating, exercising, reading, and gambling. Once, not so long ago, they were at war with each other – a fact highlighted by newsreel footage of World War II. Now, they dance together (which is progress of a sort perhaps, although the ship discotheque looks like a scene from hell). Apparently contented, they blithely enjoy their leisure, indifferent to the labours of the crew or the beauty of nature around them. In one scene a distressed young woman whirls around the deck like a pinball, though nobody appears to notice; eventually she falls headfirst into the swimming pool, apparently dead. Only an African woman seems to have clarity of vision. “Poor Europe. Corrupted by suffering, humiliated by liberty,” she sighs, gazing out at the benighted ocean. The second part of the film unfolds at a provincial gas station somewhere in the south of France, where a young boy and a teenage girl question their once progressive, now-conservative parents about their history. The family conflict is observed by an unwelcome two-woman camera crew. The discussion turns to the fate of those timeless French virtues: liberty, equality and fraternity, as the pet family lama looks on impassively. This takes us into a final section, familiar in style from Histoire(s) du cinema and the overture to Notre Musique, in which a complex montage of images, voices, textual intertitles and music chronicle both Europe’s dark past (the Holocaust, the Palestinian struggle, the Odessa Steps massacre) and its great achievements (art, cinema, literature). A copyright warning triggers the final statement: “No Comment”. 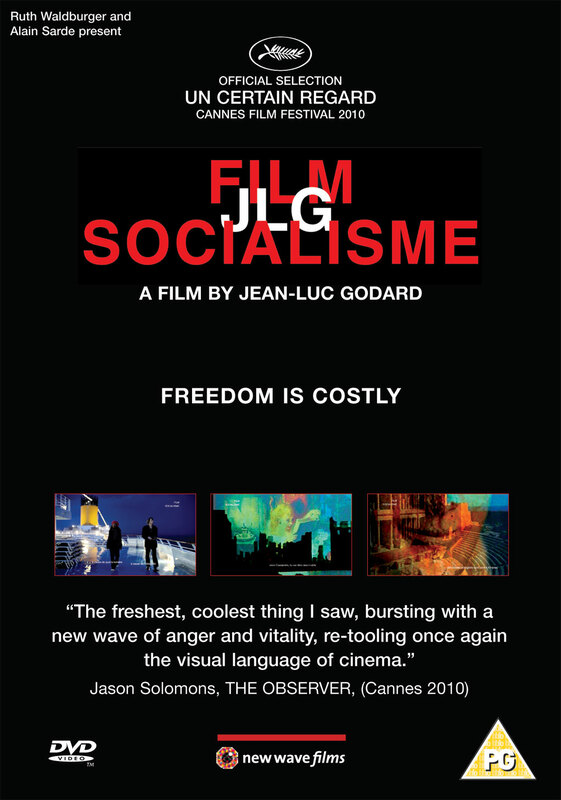 For those familiar with Godard’s more recent output, Film socialisme holds few shocks. Recognisable themes – the decline of Western civilization, war and genocide, Hollywood, the pernicious influence of television and America, the spiritual emptiness of modern life – recur, while the multi-layered visuals and soundtrack remind us once again of Godard’s infallible brilliance at framing and editing. The nearest precedent are the essay films of Chris Marker, though Godard is more reckless and less concise than his one-time Left Bank, New Wave colleague. Shooting for the first time on digital, he is not afraid to experiment. Certain scenes aboard the ship are shot on cheap cameras and then oversaturated, creating a jarring effect – especially when intercut with other sublimely beautiful scenes of the windswept deck and the rolling waves close by. There is a return of the jump cut, stop motion, elliptical full stops. Dialogue is often obscured by the wind or ship noises or cut off mid-stream. Seemingly random moments are captured and cut together as in a holiday video. Godard prophesized the ‘youtube’ phenomenon as long ago as the 1970s, and has no hesitation in adopting its methods now. New Media banality is put at the service of philosophy, of poetry. Always provocative, Godard goes one step further this time with his use of shorthand subtitles for translation of dialogue – a form of language he has dubbed “Navajo English.” Thus lengthy passages of speech are truncated to such phrases as: “nocrimes noblood”, “money public water”, “free time shopping”, “Germans Jews black.” This can be frustrating to say the least if you don’t speak French, and perhaps that’s the point; translation becomes another weapon in the war on convention. Ultimately the moments that speak the loudest are those in which no dialogue is spoken, including some wonderful and funny observational moments in the service station section, especially of the young boy pretending to conduct an orchestra or fooling around while his mother washes up. There’s also an arresting use of revolving imagery – sharks circling, the shadow of a windmill, the inner workings of a camera – evoking a sense of both wonder and underlying menace. So much depth in fact that it takes two or more viewings to really appreciate the film’s qualities. Forty years after he declared the end of cinema, Godard’s latest, and perhaps final film, leaves us much to ponder.